Breakfast- All toast and sandwiches come on a choice of our home-made fresh white bread or granary bread. Lunch- Sandwiches are served in our home-made white or granary bread, Jacket Potatoes, Wraps, Gluten Free Bread or Wraps. Dont forget to check the special's board. 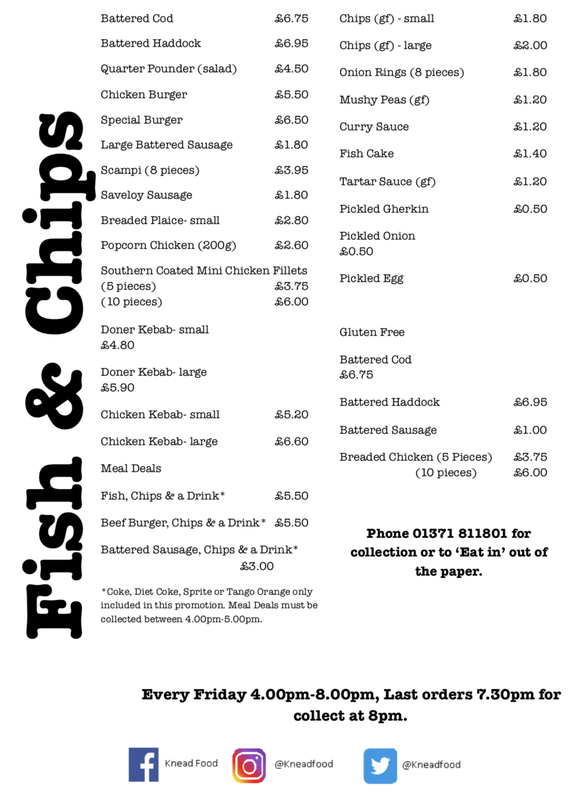 Here you can download our Fish and Chip Menu. Available Every Friday 4.00pm-8.00pm, Last orders 7.30pm for collect at 8pm. For collection or to ‘Eat in’ out of the paper. ​ We are serving Sunday lunch (3 different meats, vegetarian & vegan), along side our Specials board which includes burgers, salads and ciabatta's. No booking required. Having a function or a party? A selection of our cakes and Quiche's can be made to order and sold whole. Minimum of 7 days’ notice required. Please contact us on 01371 811801 or email [email protected] Please look at our available options.